As of 2009, the annual salary of each senator is $174,000. The president pro tempore and party leaders each earn $193,400 per year. In June 2003, at least 40 of the then-senators were millionaires. Along with earning salaries, senators receive retirement and health benefits that are identical to other federal employees, and are fully vested after five years of service. In 2006, the average annual pension for retired senators and representatives was between $35,952 and $60,972. 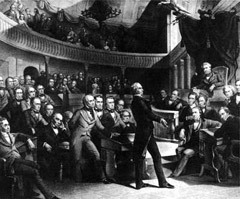 From 1789 to 1855, members of Congress only received a daily payment of $6.00 while in session. In 1855, members began receiving an annual salary of $3,000.